This week, I got an email from Baruch Amsel, who lives in Queens, N.Y. His web site features famous Jewish rabbis, including photos of their grave sites. You could call it a Find a Grave for rabbis. Baruch asked if I had a photo of the grave of Rabbi Tobias (Tuvia) Geffen, whom he referred to as “Chief Rabbi of the South back in the day.” I’d never heard of Rabbi Geffen but I offered to find out where he was buried and get a picture of his grave. There is a photo of it online but it’s not very clear. I also wanted to find out what made Rabbi Geffen so special. 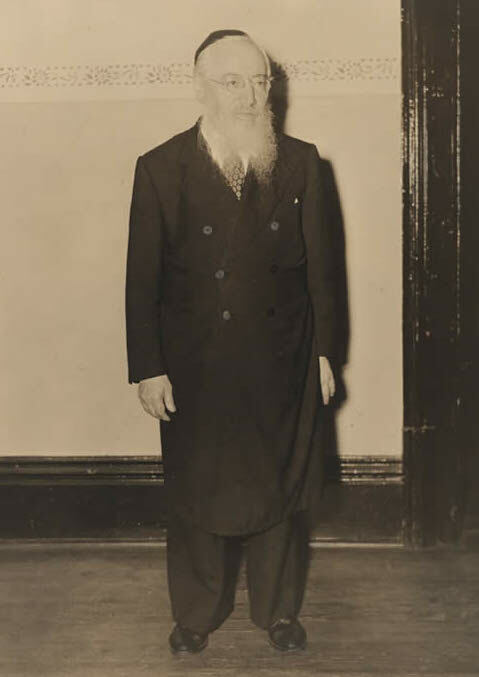 Rabbi Tobias (Tuvia) Geffen was small in stature but he stood tall in the American Orthodox Jewish community. Photo courtesy of JewishCurrents.org. A Google search fixed that. Rabbi Geffen was responsible for ensuring that Coca-Cola was kosher! Now that’s a considerable accomplishment. I wanted to know more. An article by Adam Mintz was very helpful. 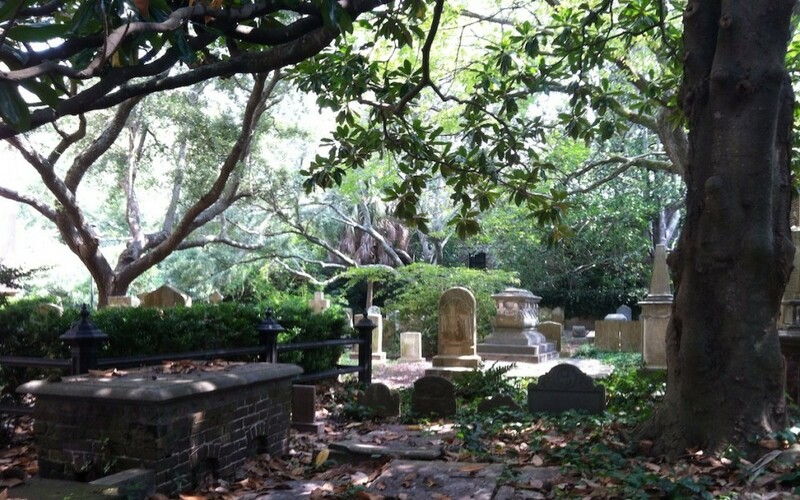 I also located his grave at Greenwood Cemetery, which is Southwest of downtown Atlanta. Rabbi Geffen was born in Kovno, Lithuania in 1870. He and his wife, Sarah, moved to the U.S. sometime after 1903 due to the anti-semitic unrest in Eastern Europe. After deciding that the cold winters of Ohio were too much, they moved to Atlanta. 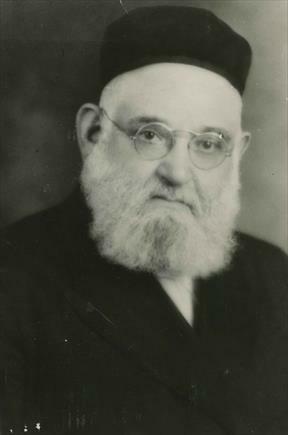 In 1910, Rabbi Geffen became the leader of Shearith Israel Synagogue (which still exists today). When the Geffens arrived in Atlanta, the Jewish community was relatively small. About 4,000 Jews lived among a population of 150,000. So how did Rabbi Geffen get involved with the “is Coca-Cola kosher?” debate? By the 1930s, American Jews (like many people) were enamored of James Pemberton’s revolutionary beverage, Coca-Cola. Problem was, nobody knew exactly what was in it. The formula (which is still locked up in Atlanta’s Sun Trust Bank) was a well-kept secret. 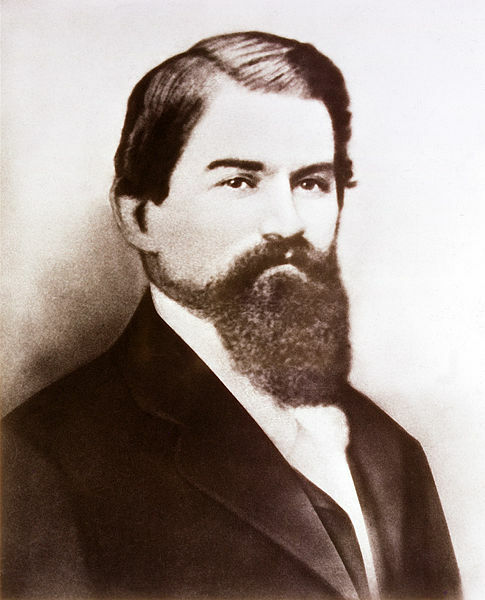 In 1886, John Pemberton invented what we now know as Coca-Cola after temperance laws forced him to make a non-alcoholic version of his French Wine Cola. It contained cocaine until 1903. Rabbis were being asked by their congregants if the soft drink was kosher enough to consume during the Passover season. Some said yes, others said no. Rabbi Eliyahu Kochin of Pittsburgh wrote to Rabbi Geffen in 1925 in hopes of finding out if Coca-Cola was kosher enough for Passover. Photo courtesy of Corinne Azen Krause Photographs, Rauh Jewish Archives at the Heinz History Center. 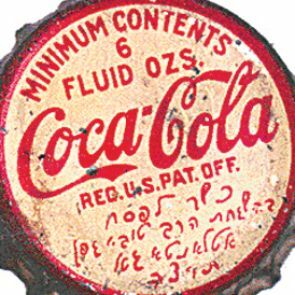 By the 1930s, two prominent rabbis had stated their belief that Coca-Cola was kosher. Rabbi Shmuel Pardes (a Chicago rabbi) said he’d visited a Coca-Cola plant in his city and had seen no non-kosher ingredients being used. He shared his thoughts with Rabbi Geffen in letters. Rabbi Geffen decided to make it his mission to find out whether or not Coca-Cola’s formula contained any items that would cause it to be non-kosher. But how was a Lithuanian rabbi who spoke Yiddish better than English going to do that? Rabbi Geffen knew someone who had access to the secret formula. He’d met Coca-Cola attorney Harold Hirsch not long after Hirsch attended the high school graduation of Geffen’s daughter, Helen (who gave the valedictorian address). Hirsch was so impressed that he paid Helen’s tuition to the University of Georgia, his alma mater (and mine!). 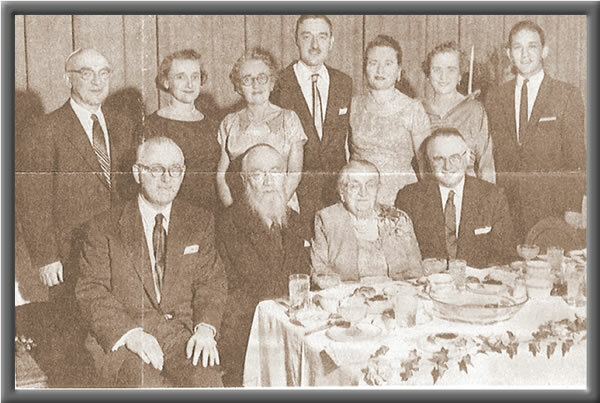 Rabbi Geffen (first row, second from left) met Coca-Cola attorney Harold Hirsch after his daughter’s high school graduation. Helen Geffen (back row, second from left) played an important role in the “kosherization” of Coca-Cola. Photo courtesy of http://www.ourfamilystory/rabbigeffentestimonial.html. Hirsch, who was active in the Atlanta Jewish community, introduced Rabbi Geffen to Coca-Cola executives. The rabbi explained the concerns of Orthodox American Jews wanting to be true to kashruth (Jewish dietary laws) while remaining loyal Coca-Cola consumers. Coca-Cola executives agreed to help and Rabbi Geffen became one of a very small group of people allowed to see the secret formula. The only stipulation was that he could not get specific on the matter if his fellow rabbis wanted to know the exact ingredients. Once Rabbi Geffen saw what went into Coca-Cola, he needed help deciphering exactly what those ingredients were. Daughter Helen, majoring in chemistry, told her father that there were two ingredients that conflicted with kosher laws: glycerin and grain kernels (corn). American Jews depended on their rabbis to ensure that “Kosher Coca-Cola” was approved for Passover consumption. While the amount of glycerin in Coca-Cola was small, it posed a problem because it was made from meat and fat tallow from non-kosher animals. Rabbi Geffen suggested (with Helen’s advice) substituting vegetable-based glycerin. Coca-Cola executives were okay with that and contracted with Proctor & Gamble to provide it. Concerning the grain kernels, sugar beets or sugar cane were a suggested substitute. That idea was also approved. “With the help of God, I have been able to uncover a pragmatic solution according to which there would be no question nor any doubt concerning the ingredients of Coca-Cola”, he wrote. “It is now possible for the most stringent Halachist to enjoy Coca-Cola”. 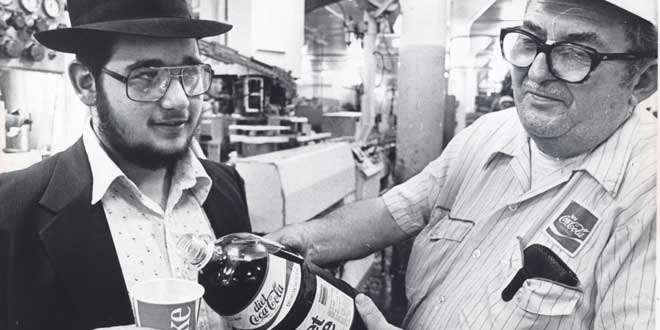 A bottler pours a taste of “kosher for Passover” Diet Coke for a local rabbi in 1983. During Passover, Coke uses a formula free of corn syrup for its kosher Coke. Photo courtesy of Detroit Free Press/Ira Rosenberg. This change did make some waves. Nazi sympathizer Karl Flach, who manufactured a German rival to Coca-Cola called Afri-Cola, returned from a trip to the U.S. carrying Coca-Cola caps stamped “Kosher for Passover” on them. A picture of the caps appeared in Nazi propaganda to fuel the belief that Jews had too much influence in the U.S. The director of Coca-Cola’s operations in Germany pushed for Hirsch to be removed from Coca-Cola’s board but Coca-Cola stood by Hirsch. Today, Coca-Cola uses high fructose corn syrup in place of the sugar cane that Rabbi Geffen asked for. But during Passover, Coca-Cola produces the sugar cane version that the kashrut demands. It’s recognizable by the yellow caps on the bottles. Non-Jewish Americans who love the old taste of the sugar cane variety of Coke snap them up as well. 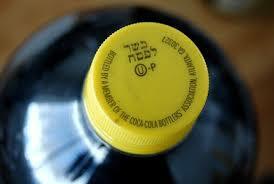 “Passover Coke” is easy to identify by its yellow cap. Even non-Jews buy it to enjoy the original sugar cane flavor. In 2012, Coke directed its suppliers to change the way they manufacture caramel to reduce levels of the chemical 4-methylimidazole (4-MEI) after California listed it as a carcinogen. The company said the new caramel process has since rolled out nationally to streamline its manufacturing process. But outside California, it’s still using the previous caramel process so that it can continue providing kosher Coke for Passover. Coca-Cola is still working on a method to make Passover Coke that meets the standards of the kashrut while avoiding the caramel issue. So California Jews must purchase their kosher Coke elsewhere for the time being. But it’s comforting to know that in the 1930s, an Atlanta rabbi was looking out for his fellow Orthodox Jews to ensure they could enjoy Coca-Cola during Passover. I found his grave at Greenwood Cemetery on a beautiful fall day and took this photo for Baruch. A sheynem dank, Rabbi Geffen. 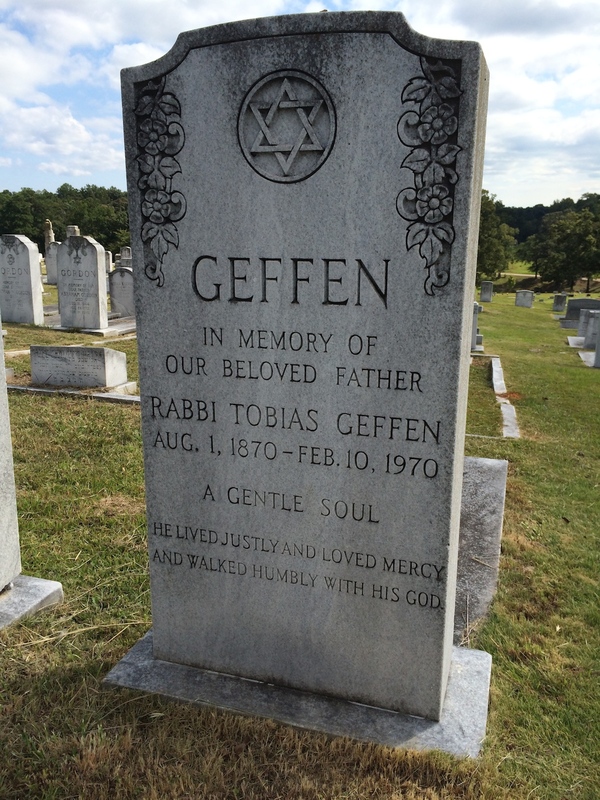 Rabbi Tobias (Tuvia) Geffen is buried in Greenwood Cemetery in Atlanta, Ga. He lived to be 99 years old.